Why doesn’t my violin sound right? When the bow is placed at the tip, the arm and the bow shape approximately a triangle/trapezoid (depending on your arm length). When the bow is placed at the bottom, the shape becomes another form of triangle. Notice the changing positions of the elbow in relation to the bow and shoulder, which are stationary. The elbow moves passively. As a result, it constantly moves back and forth as the bow travel down and up. The crucial bow holding posture in the right hand is all about leverage, much like a seesaw. The thumb acts as a fulcrum. Joined and stabilized with the middle finger, they allow the bow to pivot, and transfer weight to either side. Note that weight transfer is continuously changing when the bow is in motion. 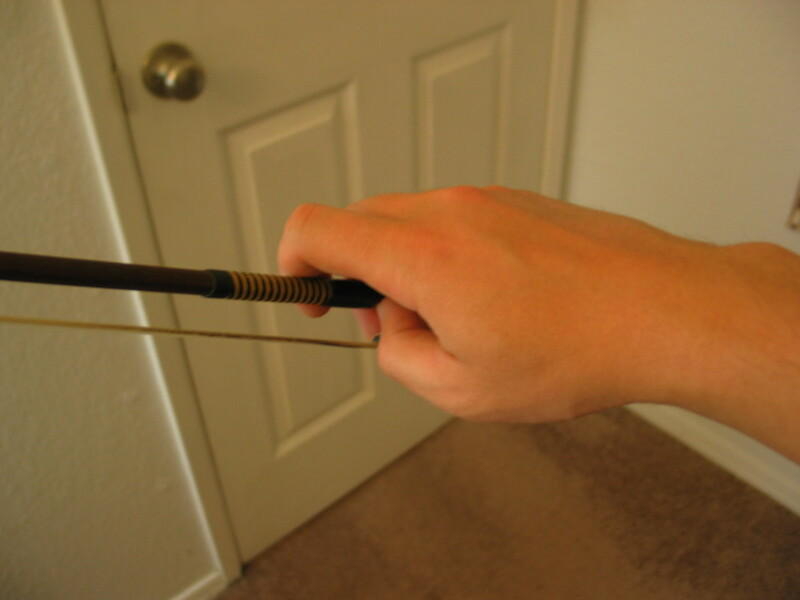 The index finger transfers the weight of the arm onto the bow when it moves toward the tip. 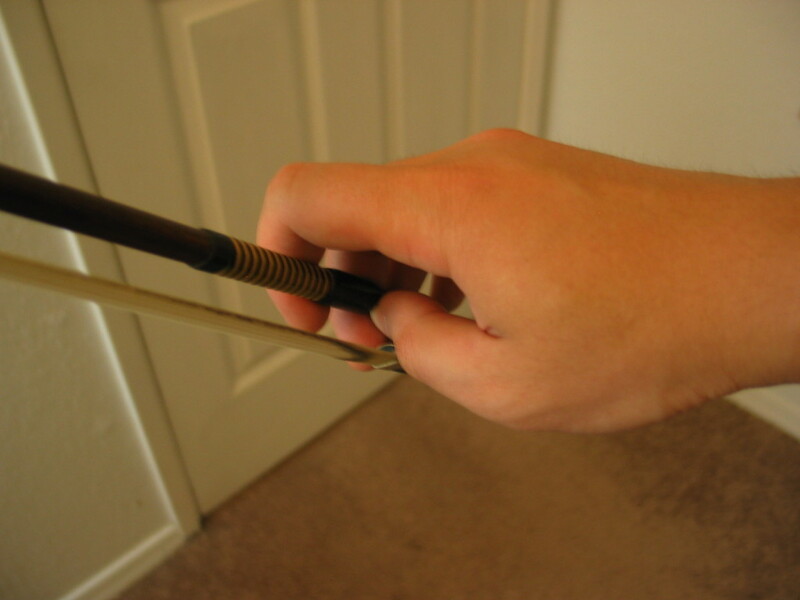 The pinky and ring finger act as counter weight when the bow moves toward the bottom. 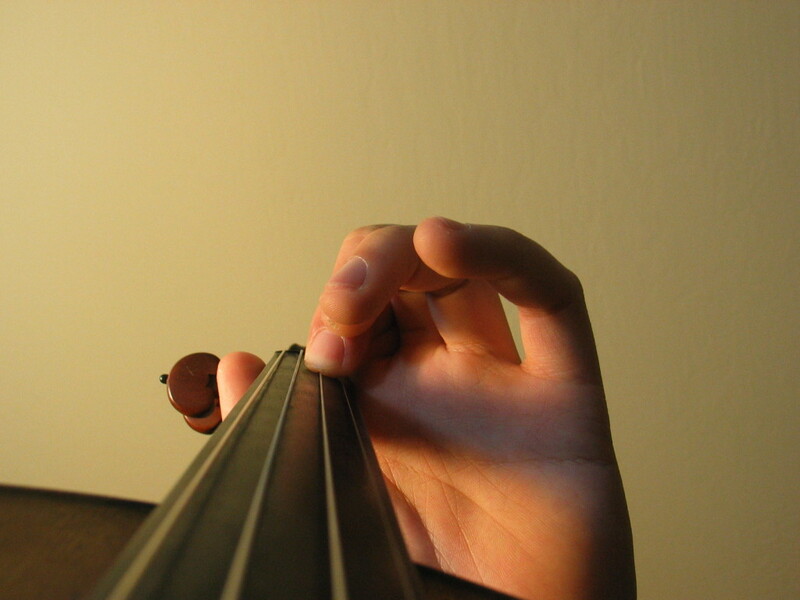 The curvatures of the index finger and pinky change at different part of the bow. 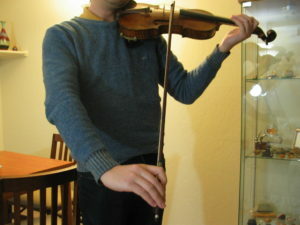 Posture of the right hand when the bow is at the middle. This image is flipped and is what you’ll see in the mirror. From the player’s point of view. 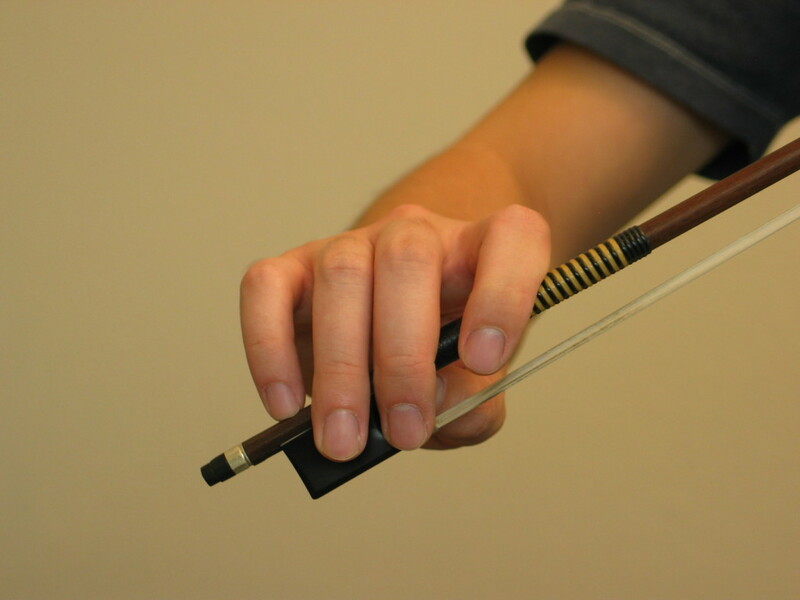 Note the wrist should be relatively flat when the bow is at the middle. This is important and will effect the control, clarity, and evenness of sautille and fast detache. A closer look at the relationship between the thumb and the middle finger. The thumb should be slightly curled to allow flexibility. Approximate location of the thumb. Traditionally the thumb aligns with the low 2nd finger (B-flat, F-natural, C-natural, and G-natural) to achieve a better balance and extensions between the fingers. Other variations are acceptable when the thumb aligns with the index finger, or slightly away from the index finger. Depending on your thumb length, you’ll need to find a place for the thumb where it can provide enough leverage, allow enough finger extensions but without creating tension in the left hand. 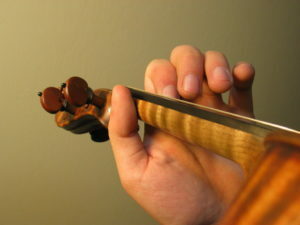 Because the left hand is placed diagonally to the neck of the violin, the 1st and 2nd finger drop and lift with mostly vertical motion, while the 3rd and 4th finger use a combination of vertical and lateral motion. 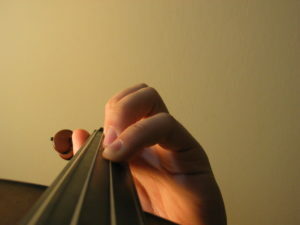 Left side of the finger tips are used most of the time, and most of the finger nails face the player. 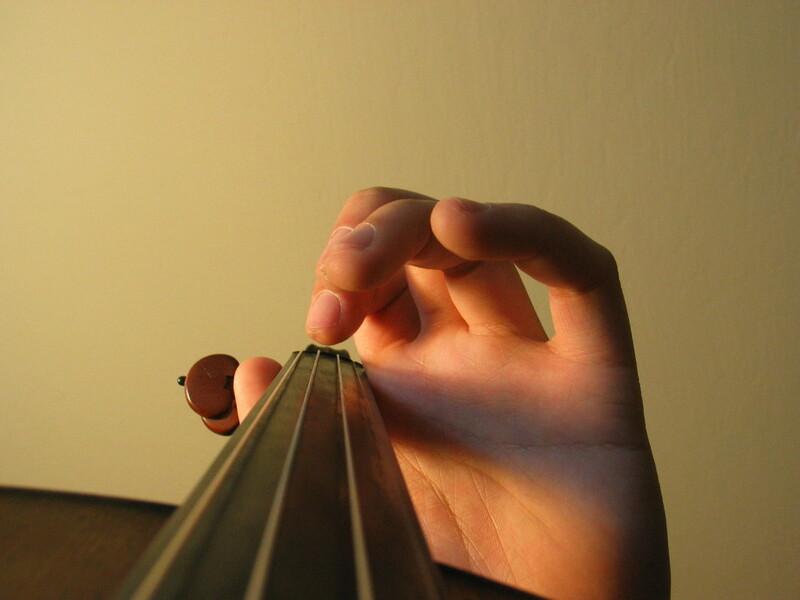 These two requirements ensure that finger pressure is used efficiently and the sound is clear, because finger tips are harder than finger pads. 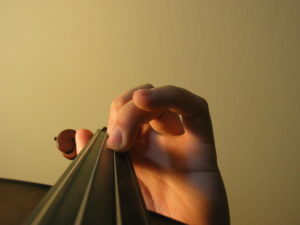 However, when playing vibrato, fingers are slightly flatten so that more finger pad is used, and the first finger joints can flex. 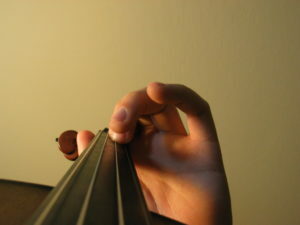 Fingers are also slightly flatten when playing the viola. This allows the fingers to cover more area because the strings are longer on the viola. Playing the viola with vertical finger tips is undesirable because the sound will be too thin. Varying the geometry of the left hand and fingers is the key to successfully learning vibrato. 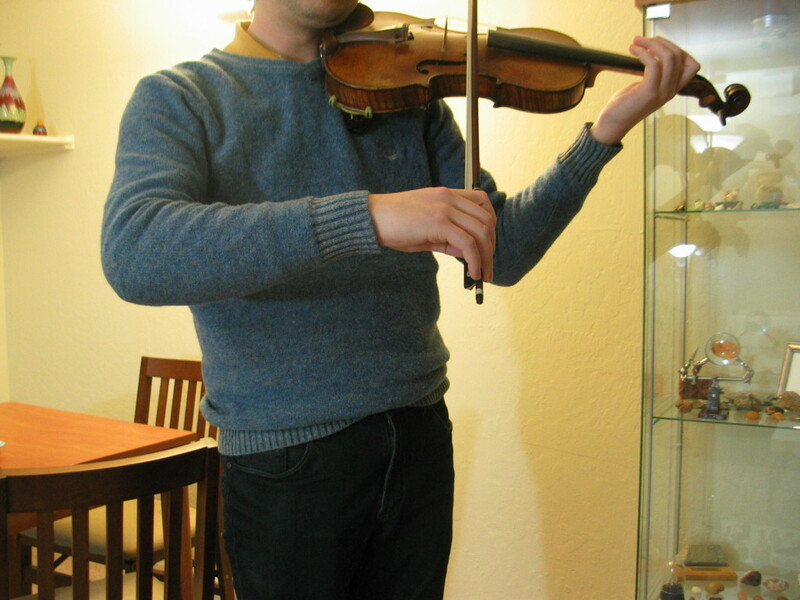 Here’s a couple of video demonstrations of arm and wrist vibrato. Pay attention to the flexing of the finger joints and the rolling of the finger tips. Remember that the only two contact points between the hand and the violin should the thumb and finger tip. 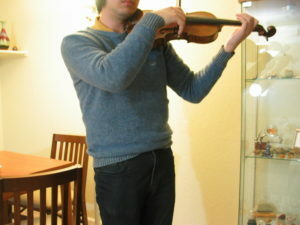 In other words, there should be a small gap between the left hand and the neck of the violin. This allows the hand to move freely without dragging the violin along. Note that in this video, the idling fingers are retracted for the purpose of clear viewing.